This is an assortment of bangles that I made using wire and silk sari fabric and beads. The other ones are leather and waxed linen and some old, weathered ball chain. I unearthed an old quilt that was made by one of my relatives. 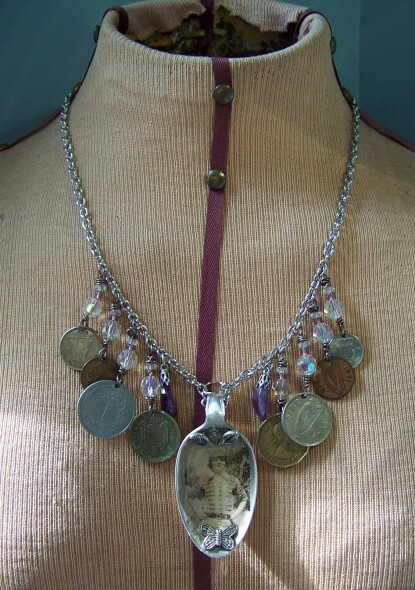 Being of an unknown vintage and in tatters, I wasn’t sad to cut it into small pieces to use in some necklaces. The original fabrics for the construction were flour sacks. 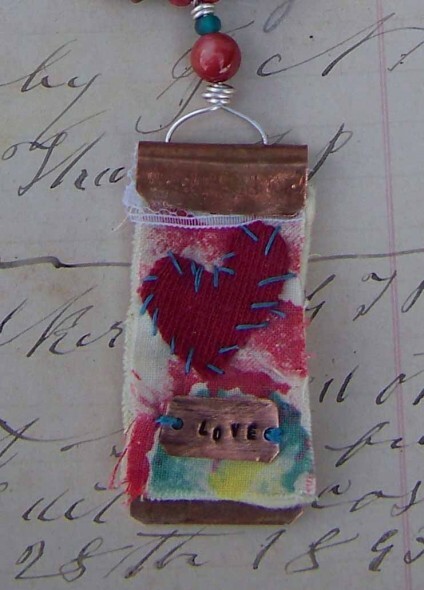 It is embellished with an appliqued heart and a hand stamped piece of copper and then I hammered a rectangle of copper to enclose it. 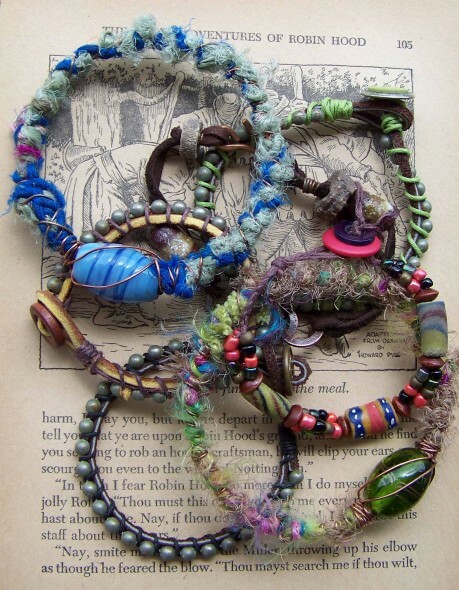 Each one is strung with glass and wooden beads to complement the fabrics. These will be for sale at the upcoming First Thursday Artisans Party at Wall Candy in Columbia, Tennessee on May 3 from 5:30 until 8:30 p.m.
Well…back by popular demand and just in time for Mother’s Day, I am offering a jewelry class at The Royal Brush in Columbia Tennessee. Campbell Plaza, Suite 7E, phone: 931-223-5351. 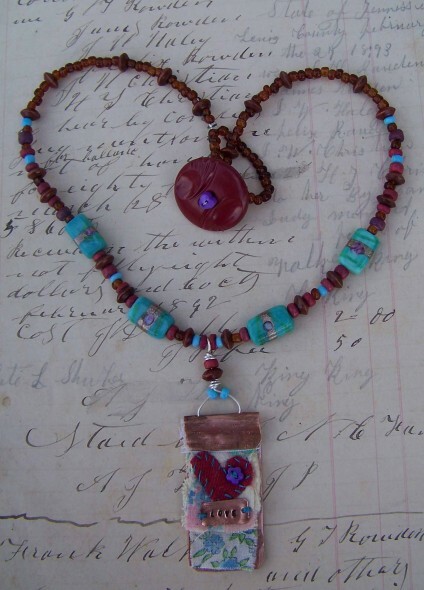 We will be learning to use pottery clay to create pendants and other jewelry elements, using stamps and molds. These elements will be fired by The Royal Brush and then we will return and use them to create our own unique adornments. The two days of the class will be Monday, April 23 and Monday, April 30 from 10:00 in the morning until 12:00 noon. The class may take a around two hours for each session, but if you like to take your time, we will take as long as we need. 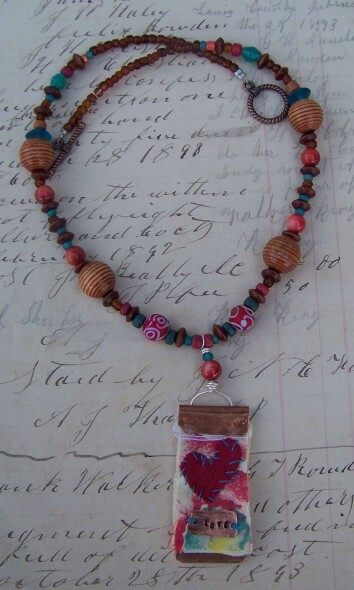 We will create at least two completed pieces, such as a necklace or a bracelet. You will also have several pendants or elements to take home with you and create your own jewelry at home.The price will be $35 and everything will be provided, but if you happen to have your own jewelry pliers, it would be good to bring them. Please either call The Royal Brush, or contact me at 931-987-9374. I would like to have at least 3 students to make the class and will take up to 6 people. Here is some of the work of the students in my last class, some completed pieces and some waiting to be finished. 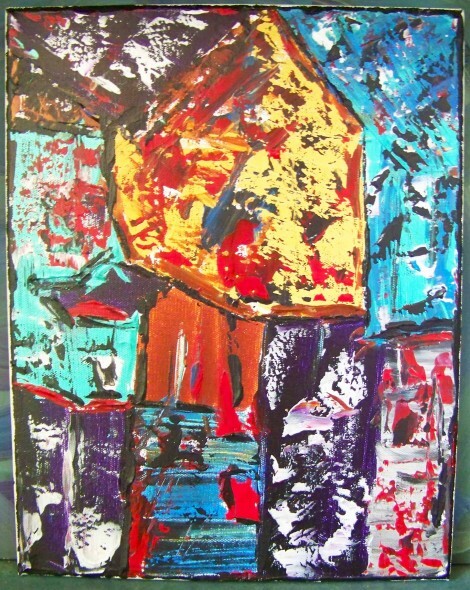 This is a painting by my talented friend Damien Boggs, entitled On Solid Ground. He surprised me with this at our show on Thursday evening. Damien has been a great addition to our Artisans at Wall Candy group. He is a super talented musician and songwriter and also helps us to locate other musicians to play at our shows that we have on every first Thursday of the month. Check out his music at his website. You can also find his music on Itunes.